You are currently browsing articles tagged comparison. There are a number of blogs and sites I check out most every day in order to stay current with the latest photo equipment, news, and discussions. One of my favorites is Canon Rumors, which – as the name would imply – is all about the latest rumors regarding new Canon cameras, lenses, and firmware updates. It is particularly useful if you are thinking of purchasing a new body or lens because you can find out if the particular model you are interested in is rumored to be updated soon, thus possibly affecting your purchasing decision. If you follow it regularly for just a couple weeks, you can get good feel for all the expected new releases. For example right now, the Canon 550D/ Rebel T2i came out just about when it was predicted, and the Canon 60D is rumored to be coming out any day now. 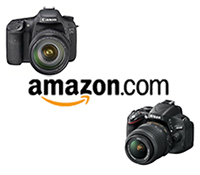 It also has a great Price Watch section where you can compare the current prices of numerous cameras and lenses at a variety of retailers such as B+H, Adorama, and Amazon.